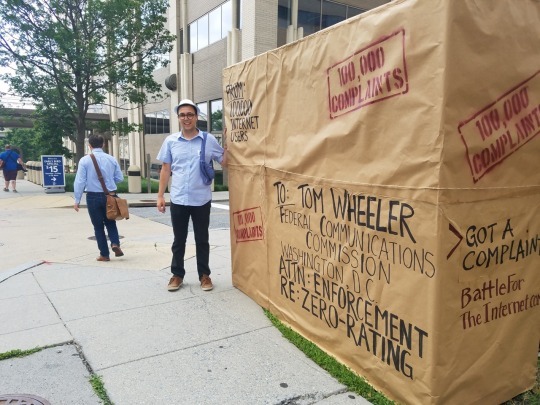 WASHINGTON – Today, more than 100,000 complaints from Americans who support a free and open internet were delivered to the Federal Communications Commission (FCC) calling on Chairman Wheeler and the other commissioners to investigate and take strong enforcement action if and when companies violate the FCC’s Open Internet Order with zero-rating schemes that control individual users’ content choices. Scroll to the bottom of this post to see photos. These photos are available for use by the media. Credit: courtesy Fight for the Future. 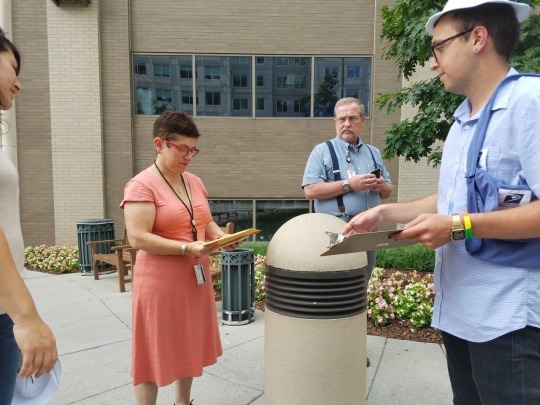 The complaints were delivered together in a “Special Delivery” Package that was left for FCC Commissioners ahead of their June open meeting. This push by more than 100,000 individuals comes on the heels of last week’s court decision upholding the FCC’s Open Internet Order and giving the commission strong legal ground to investigate zero-rating schemes where companies charge tolls or act as gatekeepers on content. Helping lead the charge to gather this groundswell of complaints were membership organizations and public interest groups including Fight for the Future, Center for Media Justice, Demand Progress, 18millionrising.org, Daily Kos, Credo Action, and Free Press. Many of the complaints were targeted at specific zero-rating schemes by Comcast, Verizon, AT&T, and T-Mobile from individual customers. 80,000 of the complaints hand delivered to the FCC today were also delivered into the Open Internet docket in the FCC’s ECFS system. In addition, over 20,000 were delivered into the FCC’s new Zendesk complaints system. 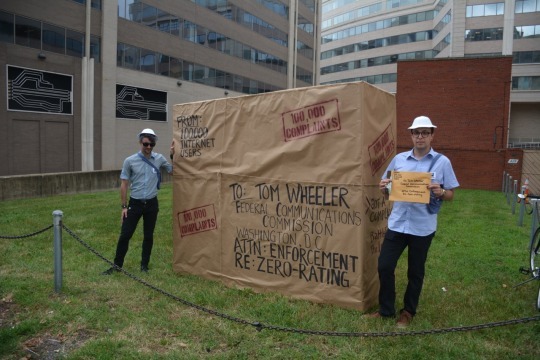 Today’s delivery of 100,000 individual complaints calling for enforcement actions against zero-rating follows a March 2016 letter by 54 advocacy groups urging the FCC to take action against these zero-rating schemes, and a May 2016 letter to the FCC by more than 50 companies and grassroots organizations calling for an open, public process for zero-rating proceedings. “Last year, millions of Americans called on the FCC to protect the open Internet and pass strong Net Neutrality rules. Now that these rules are the law of the land, the FCC should listen to the large number of people who are fed up with their carriers distorting competition and threatening consumer choice with these zero-rating schemes and take action to stop these clear violations of net neutrality,” said Holmes Wilson, Co-Founder and Co-Director of Fight for the Future. “Our community will not be sold a zero-rated Internet that gives us half the story and half the power to fight back. Every one of us deserves the right to control what content they access and how they share knowledge and express themselves. The 100,000 individuals whose complaints were delivered to the FCC today and millions more around the country won’t stand for these bite sized zero-rated Internet plans that limit how we connect and how we organize,” said Malkia Cyril, founder and Executive Director of the Center for Media Justice (CMJ). “The same cable and phone companies that fought so hard to destroy Net Neutrality are creating harmful new schemes that pose a serious threat to the open Internet. The FCC should investigate and take swift action against these zero-rating plans. Furthermore, this decision should not be made behind closed doors–the FCC should have an open, public process to decide where and how to enforce these rules,” said David Segal, Co-Founder and Executive Director of Demand Progress. “For Asian Americans and Pacific Islanders, and other communities of color, an open internet helps level the playing field by providing spaces for cultural, economic, and political engagement in which our experiences, identities, and language needs are reflected. These zero-rating schemes distort people’s ability to use the applications they want and view the content of their choice, directly attacking everyone’s ability to communicate,” said Cayden Mak, Chief Technology Officer of 18MillionRising.org. “Internet users won decisively in court last week. That means ISPs can’t block or discriminate against what that their users want. But the FCC also has a duty to make sure broadband is offered on reasonable terms, without artificial penalties for people who have the audacity to actually use the connections they buy. If exemption-riddled data caps disincentive use of the open internet and keep people tied to incumbents’ preferred products, then the FCC has to consider the impact on choice and affordability,” said Matt Wood, Policy Director of Free Press.